Two events I attended this week had some similarities. Both were musical performances held outside on beautiful Mediterranean evenings, both began with brief talks by the host, both included musical performances by an oud player, both audiences were international, and both were quite fun. Both, however, left me somewhat uncomfortable. There were some differences as well. The first was at the United States’ Ambassador’s residence, with a lovely reception on the lawn and praise for the music-for-peace group that had been touring Israel. 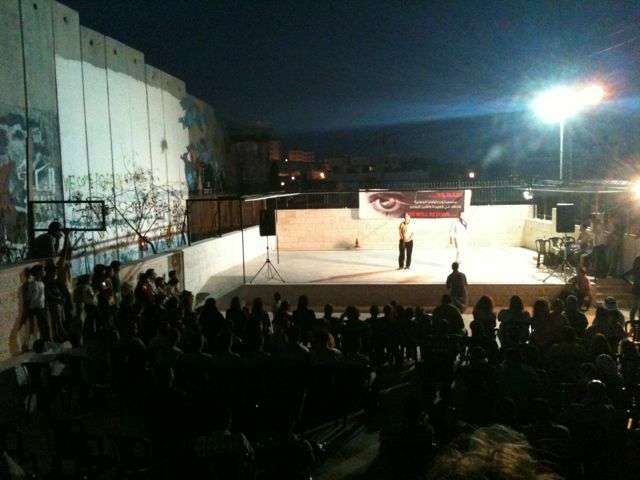 The second was in a small cement amphitheater in the Aida Refugee camp, just on the far side of the separation wall, and featured both music and some awesome dancing from a traditional Palestinian dance troupe. 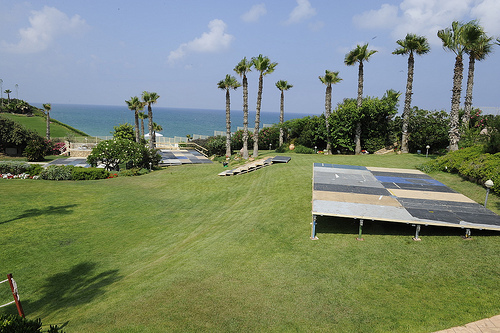 The first event made me uncomfortable because I would like the United States position to have remained more critical of Israel’s ongoing settlement building far from the green line. The U.S. is not helping itself or Israel by not telling the truth, firmly and repeatedly, about the religious-national settlements deep in the West Bank. The second event made me uncomfortable because of the rhetoric around the Palestinian right of return. The huge key above the camp entrance can be interpreted as a “never forget” kind of symbol, a mourning for what has been lost. But there was a beautiful new poster with an eye whose iris was the Palestinian flag, bearing the phrase in English “We will return…” The main speaker also spoke about how the right of return was central to any peace deal. A deal that gets Israelis out of an expensive and morally degrading occupation is going to have to involve evacuating those settlements. A deal that gets Palestinians a state of their own and looking to the future is going to have to involve giving up the right to return to places that have been in Israeli control since 1948. I would have liked the Ambassador and the head of Aida camp’s cultural group to have been able to say those things clearly. It wouldn’t solve everything – East Jerusalem would still be a big sticking point, for example. Without the Palestinian refugees letting go of that sixty-three year-old loss, and without the Israeli settlers letting go of their vision of a Greater Israel, however, I don’t see how the impasse will be broken. Both oud players were terrific to hear, by the way.